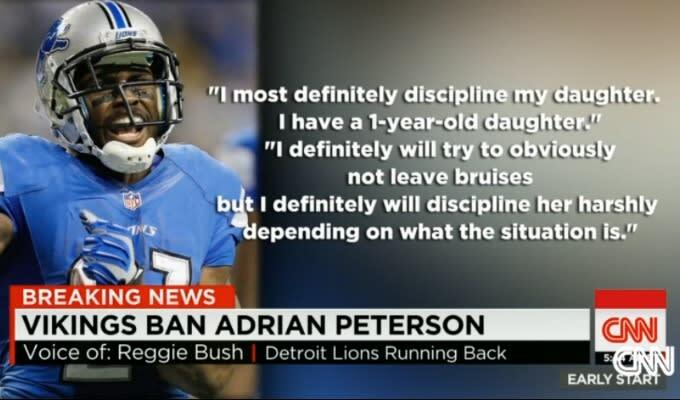 Yesterday, Detroit Lions running back Reggie Bush appeared on CBS New York&apos;s Boomer and Carton Show, speaking on the recent allegations of child abuse surrounding his fellow NFC North running back Adrian Peterson. Bush spoke candidly on the situation, but perhaps a little too candidly. The image you see above captures Bush&apos;s most salient quotes from the interview. Essentially, Bush is admitting to "harshly" disciplining a 1-year-old child. A baby, really. He is completely thorough in his remarks too, leaving no doubt about what and who he is referring to. Obviously, these remarks are a tad disconcerting. Parents are allowed to have a certain amount of breathing room when they decide the proper ways to discipline their child. But harshly disciplining a 1-year-old seems a tad excessive, no? He&apos;ll "try" to not leave bruises? How about he just doesn&apos;t, period? Why is that even a question? Obviously I&apos;m not going to be spanking a 1-year-old girl. We do discipline her a little bit because she does this thing now where if she doesn&apos;t like something of if you say something to her she doesn&apos;t like, she kind of swings at you. So we&apos;re already starting to implement little things like talking to her and saying that&apos;s not OK. I think obviously people took it too far and [said] I was doing much worse and that&apos;s not the case. Just like the world is changing, the league is changing with it. Some things are to the forefront and we just have to be mindful of that. Every little thing in this league is being scrutinized because of a few individuals and not getting into what&apos;s been done with them or what&apos;s this punishment is. You play in this league and it&apos;s a privilege and we have to treat it as such. You can watch the full Boomer and Carton segment featuring Bush below.